Several years ago our church asked the question, “What if we each gave up one Christmas gift this year and gave that money to someone in need?” That began a Christmas tradition in our home. Every year we each have the option of receiving one less gift ($25) and donating that money to someone in need. 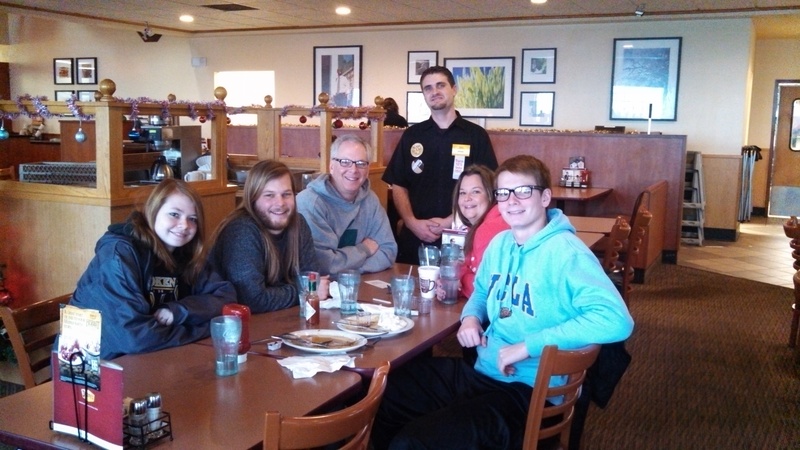 Christmas at Denny’s began when our family got stranded during a snowstorm in Arizona. The only place open in town was Denny’s. The waitress had been working since 5am and was completely exhausted. That’s when Herk decided to use his $25 for the tip. Next thing you know we were all putting our money in. Now, every year at Christmas we stop at a Denny’s. This year we stopped just outside Joplin, MO. Pulling into the parking lot we prayed a simple prayer that God would place us at the right table. That’s where we met our waiter. He and his wife had just recently moved closer to family and were trying to get back on their feet. He had no idea he was about to get a $160 tip on Christmas ($25 per person + the original tip for those of you wondering how $25 adds up to $160). What I’ve discovered is that this experience isn’t really about the waiter or waitress. It’s about my family. The joy we experienced in giving was greater than any gift we could have received. We asked his permission to take this picture and put it on social media. Meet Jamie and take a moment to pray for him and his wife.